NO Dyslexia-Specific Laws: Hawaii, Idaho, Michigan, Montana, North Dakota, South Dakota, Vermont, Wisconsin. Remember even if your state doesn’t have a specific Dyslexia law, federal law including the Department of Education formally recognizes Dyslexia and has statement about dyslexia being mentioned specifically in IEPs and 504s. It is important to mention dyslexia specifically by name as dyslexia is not simply a “reading disability”. Dyslexia has a long scientific, clinical, and educational history and the better a student’s educational needs are recognized, the more likely a student will have a well-suited educational program. If you have any updates or corrections, please contact the team “at” dyslexicadvantage.org We would like to keep this list as current as possible. Addendum: Congratulations Alaska, Georgia, and Kansas for their new laws. Alaska – 2018: H.B. 64 Establishment of dyslexia task force (task force only – no requirements for teacher training or student screening). California- 2015: A.B. 1369 Identification and assessment, program for to improve educational programs for dyslexia prepared. Colorado – 2008: H.B.1223 Training and identification. Connecticut- 2016. 2015. 2014. An Act Concerning Dyslexia. Assessment and Teaching / Reading Tutor Training. Public Act 16-92. Public Act 15-97. Public Act 14-39. Delaware- 2015: An Act to Amend Title 14 of the Delaware Code Relating to the Education of Students with Disabilities. Severe dyslexic students can waive state assessments. Evidence-based interventions. Florida– 2017: HB 7069. Evidence-based and systematic, sequential, and multi sensory strategies added to Florida Educator Practices. Teacher renewals must include “explicit, systematic, and sequential approaches to reading instruction, developing phonemic awareness, and implementing multisensory intervention strategies. Teachers, reading coaches, school administrators taught to recognize dyslexia. 2015. John McKay Scholarships for IEP or 504 student to a ttend a public school other than assigned or private school for students with learning disabilities. State Board of Education Rule 6A-6.03018. Reading First. Georgia – 2019: S.B. 48 required dyslexia screening and special training methods for those with dyslexia. Hawaii- NONE: 2010 bill related to providing technical assistance to those with dyslexia was repealed. Illinois– 2018: H.B. 4639 Established dyslexia handbook. 2014: HB. 3700. Assessment, professional development, intervention. Indiana- 2018: S.B. 217 Requires trained reading specialists to identify and modify teaching students with dyslexia. 2015: H.B. 1108. Defines dyslexia and requires professional training programs. Iowa – 2018: S.F. 2360 Dyslexia task force established. 2016: ARC 2586c. Change in the Iowa Administrative Code to require teachers to know about dyslexia and the structure of language. 2014: Senate File 2319. Kansas – 2018: H.B. 2602 Dyslexia task force* established. 2008: H.B. 5015. Screening, best practices for instruction, teacher prep – unfortunately this bill failed. *Task force only; no requirements for teacher training or student screening. Kentucky– 2018: H.B. 187 Definition of dyslexia and screening toolkit. 2012: H.B. 69. Includes dyslexia, dysgraphia, dyscalcaulia, phonemic awareness. Louisiana- 2013: (R.S. 17:7:11) identification, assessment, intervention, accommodations. Maine – 2015: LD 231. Definition, screening, consultant. Maryland – 2015: H.B. 278 Dyslexia Task Force. Task Force only. No requirements for teacher training or student screening. Massachusetts -2018: General Law Chapter 7 Section 57A Screening procedures and protocols. Massachusetts General Law Chapter 15A Section 30. No resident of the commonwealth of MA with a developmental disability (including dyslexia or other SLD) should be required to take a standardized college entrance exam for a public-funded higher education institution. Michigan – NONE: In 2016, Governor signed the 3rd Grade reading retention law. Minnesota – Revised Dyslexia Definition. K-12 Bill.The department must employ a dyslexia specialist. Dyslexia screening tool. Mississippi– 2017: H.B. 1046 expansion of the previous bill, scholarship eligibility raised to Grade 12. 2012. H.B. 1031. Scholarship to provide dyslexic students with school choice. Missouri– 2016: H.B. 2379 Sscreening for dyslexia in all public schools including charters. Montana– NONE: 2019: S.B. 140 awaiting governor’s signature (would require screening and assistance for students with dyslexia) Montana Office of Public Instruction did add dyslexia to their special education guide. 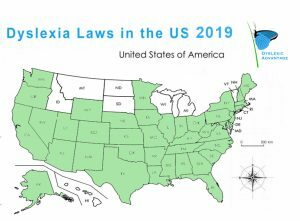 Nebraska– Dyslexia Assistance Document Dyslexia Definition Revised. Nevada– 2015: AB 341 and SB 391. Dyslexia screening and intervention. New Hampshire– 2016: Passed HB 1644. AN ACT relative to screening and treatment for dyslexia and related disorders and establishing a reading specialist in the department of education. New Jersey– 2014: PL2013 c 131, 105, 210. Dyslexia definition, minimum professional development, and screening for learning disabilities. Definition of dyslexia in administrative code. DOE Dyslexia handbook. New Mexico– 2010: HB 2010. dyslexia definition, provide phonics-based tutoring as part of RTI. New York- 2017: A08262. Guidance memorandum to all districts on dyslexia, dysgraphia, and dyscalculia. North Carolina– 2017: S.B. 149 Dyslexia in the Education Code. Requires State Board to develop tools to ensure the identification of students with dyslexia and dyscalculia. Dyslexia Topic Brief. North Dakota– NONE: 2019: H.B. 1461 awaiting senate vote (defines dyslexia, requires screenings and special training for teachers). Ohio– 2011: Dyslexia training for k-4 teachers. Pilot project for intervention (year 3 finishes Oct 2015). Oregon – 2017: More dyslexia screening. Timeline changes to HB 2412. 2015. H.B. 2412. SB 612. Teacher training, dyslexia screening, dyslexia specialist. Pennsylvania– 2014: A.B.69 Dyslexia screening and early literacy pilot program. Rhode Island – 2016: H7052. Improve the performance of students with dyslexia in math, reading, and writing. 2012. H 7542. Definition and intervention. South Carolina– 2013: South Carolina Task Force Report. Tennessee– 2016: Say Dyslexia Law. Advisory committee, universal screening (through RTI or other), professional development. 2014. HB 1735 / SB 2002. Dyslexia is Real Bill. Texas– 2018: Updated Dyslexia Handbook. 2009. 1995. Dyslexia Screening and Treatment, Licensed Therapists. Utah– 2015: HB. 117 Pilot programs for professional development, literacy interventions K-5. Vermont- In 2362.2.5, dyslexia is listed under special education. Eligibility for special education is specified. Virginia- 2016. HB 842. New teacher training in dyslexia.2017. SB1516. Dyslexia advisor in every school district. Washington- 2009: RCW 28A.300.530 Individuals with Dyslexia – identification and Instruction. Handbook. West Virginia– 2014: Definition of Dyslexia Dyscalculia. Wyoming– 2012: S.B. Assessment and intervention. Thanks Martha Youman and Nancy Mather for their Update on Dyslexia Laws 2018. The paper is also available on Research Gate here. Hi guys! Iowa laws are not up to date. There is a new task force law that passed this year! Here is information on that. http://www.decodingdyslexiaiowa.org/2018-legislation/. Thanks! Thanks for sharing and Congrats!!! Its amazing seeing somecmuch progres! Kansas just passed HB 2602 – Creating a Dyslexia Task Force!!! Wow – thanks for the updates, Jennifer! You folks are working so hard and getting results! It’s wonderful to also begin seeing laws regarding dyscalculia and dysgraphia. If it’s not specified, it’s definitely missed. Thank you for helping keep us updated and congrats Decoding Dyslexia – all 50 states! The Massachusetts law is not helpful at all on the level of reading instruction or teacher training or any helpful practical way for supporting kids to learn to read. Pending Legislation would screen all kids for deficits in the key indicators, phonemic awareness, naming speed and letters and knowledge. This map is not really usefully showing the reality of kids being denied FAPE when they have dyslexia. In Massachusetts, we wait for kids to fail, find them late, refuse to say dyslexia so rarely provide evidenced-based instruction for dyslexia and then waive a test score? That’s a pathetic answer to a serious issue? Thanks for this clarification, Nancy. We hope the pending legislation passes! Agreed… the current Massachusetts law is not helping my third grader succeed.. I’ve been fighting for better services since January of grade 1 and keep getting the minimum. Very discouraging experience as a mother and as an educator!!!! Maryland only passed a task force – whose recommendations have not been acted on. There are currently no requirements related to the education of dyslexic students. Oregon passed two additional bills in 2017 that amend the 2015 bills. — SB 1003 (2017) provides more clarification (next steps) to SB 612 and adds a screening component for risk factors of dyslexia. — SB 221 (2017) provides some timeline changes to HB 2412 as well. I meant *these. I would like to help. Thanks, Cynthia! To get involved at your state level, we usually recommend that people get in touch with their local Decoding Dyslexia Chapter. For your state, that would be Decoding Dyslexia New Jersey. If you’re on Facebook, we’ll also announce big events for the Dyslexia community on our Facebook feed Dyslexic Advantage on Facebook. Thanks for joining the fight!